For many, Carol Drinkwater will be forever remembered for her part as the wholesome Helen Herriot in the television series All Creatures Great and Small. Where does The Olive Farm rank among all the audiobooks you’ve listened to so far? I'd rank this title somewhere in the top third of all the books I've listened to. What was one of the most memorable moments of The Olive Farm? I thought the most memorable scenes involved Carol dealing with forces outside her control -- French bureaucracy, the locals, various animals, storms and fires. Which character – as performed by Carol Drinkwater – was your favorite? I found it interesting that she is a much more complex character herself than the one she is most famous for portraying on television. She is not afraid to reveal her quirks. No, it was perfect in about one-hour bites, as I listened to it on my lunch hour. In the personal memoir genre this book ranks very high. What does Carol Drinkwater bring to the story that you wouldn’t experience if you just read the book? Carol Drinkwater's language, voice, and attention to detail.. She is an excellent and intelligent reader and uses language and description so well that you really can visualize her description of the area and all its attributes. This is a case, given her skills, that could only have been narrated by the author. I'm going to move on to the next olive book in her series. Would you listen to The Olive Farm again? Why? What did you love best about The Olive Farm? I liked hearing about following their dreams and dealing with some tough odds to make things happen. This is a good book for those who like hearing about living in a different country, travel also about a new love coming together. Written and narrated by the actress who was the wife in All Creatures Great and Small. Wanted the second book but it is not on audible so I will have to read it! One of the first audio books I bought was Peter Mayle's Year in Provence, having heard it on Radio 4's book of the week, and this is a return to similar territory but the with added interest of the development of an olive farm and the attendant technical and horticultural activities. The author narrator is an accomplished actress, who does an excellent job of bringing it all to life and overall it is a charming easy listener, which provided an interesting break from my usual crime and history diet. It's a story about international family (Irish woman & divorced French man w. family) buying almost ruined house together. In story house is situated between Cannes and Frejus. Story is the Irish womans point of view. First summer they move in before they own house. It's made possible by pre-payment and scheduled buying agreement. Starting without water, electricity and leaking roof they manage to spend a summer without quarrels. In the end she get's to stage of starting olive garden. It's quite like Peter Mayle's Year in provence, but it doesn't concentrate French-English confrontation and secrets of France like Mayle does a lot. It's more problems oriented like handling bying a property as (Irish) foreigner and owning house as foreigner and living abroad. So if you are even thinking bying house in France this is really worth of listening. Sample is too short to tell enough of this book. If you liked the "Year in Provence" you most likely end up bying more than this first book. I liked it and it was easy enough to listen as not a native English speaker. A lovely easy ready. Really takes you to the hot countryside outside Cannes. Have not been able to put it down and definitely for anyone that craves sunshine and sunny days. Loved this. The taste and the scent of the South of France is almost tangible. An exceptional book. Listening to the naration you are transported to the south of France. I cannot wait to find the next book by Carol Drinkwater. Good quality and excellent narration from a talented author and actor. Can highly recommend this book. Made me want to sack it all in and move to France! A wonderfully rich story full of tears and joy. I could hear, see and smell the beautiful French countryside. So moving in parts, I don't know how Carol carried on reading. Can't wait to download the next instalment! 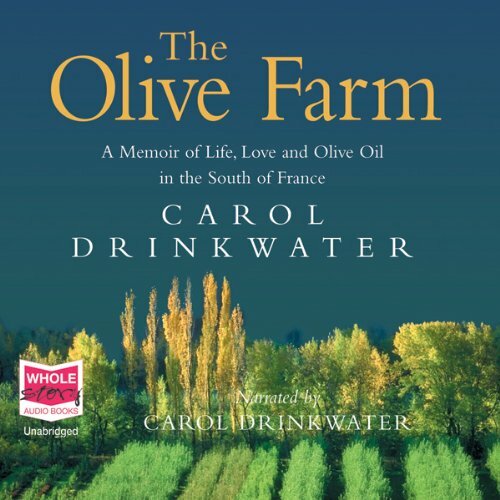 It was a lovely listen, and it made me want to know more about Carol and her farm! I will buy the other 2 books ! Her reading.....or rather acting .....was also very enjoyable. However I felt that she 'over wrote' her story which was a shame!! When I bought this book, I didn't realise it was an autobiography. I really prefer fiction. However, this was an entertaining listen that I was surprised to enjoy.